The Impending Doom, Hoar's holy day, where the names of those deserving Hoar's vengeance are spoken, and the drums roll as Thunder. Upon it's eve, Hoar's faithful prepare themselves for the following day. The priest and paladins fast, and spend their night in prayerful vigil. For the less stringently devout, there is still much to be done. 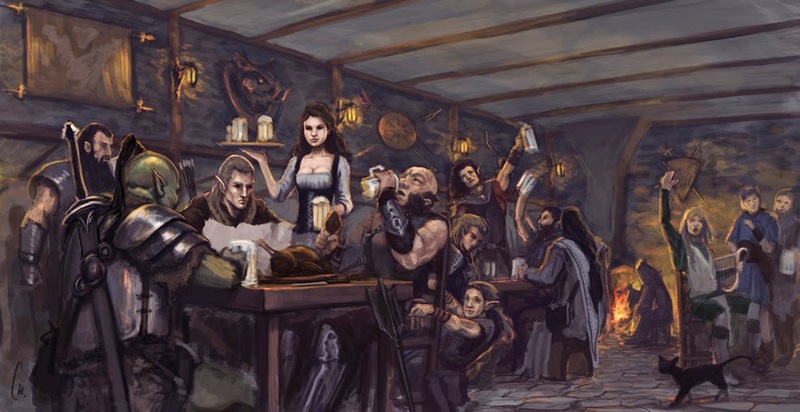 Within the Lair, game is set upon spits to roast, food prepared, mead and wine brought in- a simple feast, designed to replenish the faithful after a day spent in rigorous purification rites. Drums and masks are wiped clean, and made ready. The past day saw the dark armoured paladin Talas return to the lair to commence his purification. That morning he was seen stripped down to tunic and breeches, diving into the icy cold water. Emerging from the chill he would dry off, then sit shivering for a little while before returning inside the lair. The same occurs at noon, then in early evening, before the feast of the Impending Doom begins proper. But I shall give a proper share to you. Kory overlooks the field near the Uldoon trail. He speaks in depth with Kald Blake about battle field approach. The vision of the Bane's hordes gathering ever present in his mind. As he looks and discusses brief flashes of combat come to him. In his head he can hear the clash of armies and the great clangs and screams associated with it. Feeling the chill wind nip at his forearms he decidedly turns around ready to start scouting the area only to find a band of brigands had happened upon them. Kory is sitting in the grove enjoying the peace when Nai arrives in a swirl of leaves and wind. With her is a surprise for him as he nearly chokes on his scone seeing Vendor and Terri walk from the swirling leaves with Nai. Hastily he picks up his lunch and greets them all. After some hearty greetings the mood is struck back to more serious tones.....The ill tidings of cults, hordes and god wars was coming to a head and the time was nigh when this would all be settled for now. The group waits for others to come and when they do Nai explains a ritual in which she entreats her patron deity Silvanus, The Oakfather. In it she saw two leaves locked in a dance upon the water while a third danced around them. Then four others came to the three and as they did the three were drawn into each other and the water left calm after that. A strange vision indeed but like all its meaning was more clear now than before as this was one of many all pointing in one direction for the group that had taken it upon themselves to save the land. The old druid walks into the circle and Nai greets him. After the initial greetings the group begins to converse. Nai explains to the old man that they have decided to open the way and it is met with a astounding and hearty rebuke of the old druid. THE CONDITIONS HAVE NOT BEEN MET! The words sting the group like a thousand little needles all buzzing about them in a drone. How could this be?! What conditions? Kory breaks the silence by asking what conditions are needed which is quickly answered that the cauldron is the condition. Kory quickly informs the old druid he has the cauldron and to the surprise of the wise old forest walker. A flurry of conversation and debate ensues then it is decided. The cauldron is loaded up onto the caravan and Kory cracks the reins as it rolls out to its destination and its fayt....Pietr and Pol had fought endlessly for long enough. The wooden wheels of a cart come to a creaking halt as the weight inside shifts with the stop. 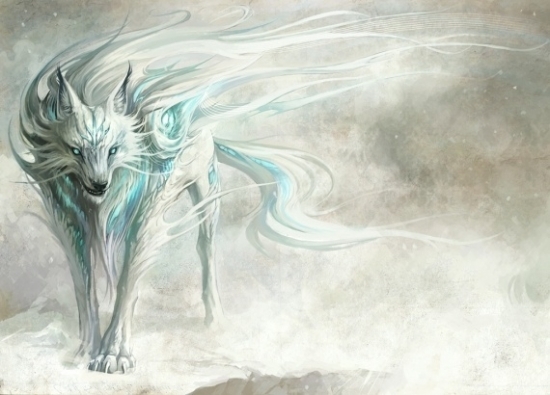 Vigilant eyes sway back and forth through the grove as he comes upon it. The druids had gathered and were already there waiting on the cauldron. Stepping down off the cart seat his hands go to work untying each and every tie down on the covering. Pulling it back in a ripple of sound as the covering whips through the air reveals a dark iron cauldron adorned with four acorns in decorative fashion. With a grunt and some strain the iron beast is brought off the cart and placed into the circle where the ritual began. Balance was to be restored. 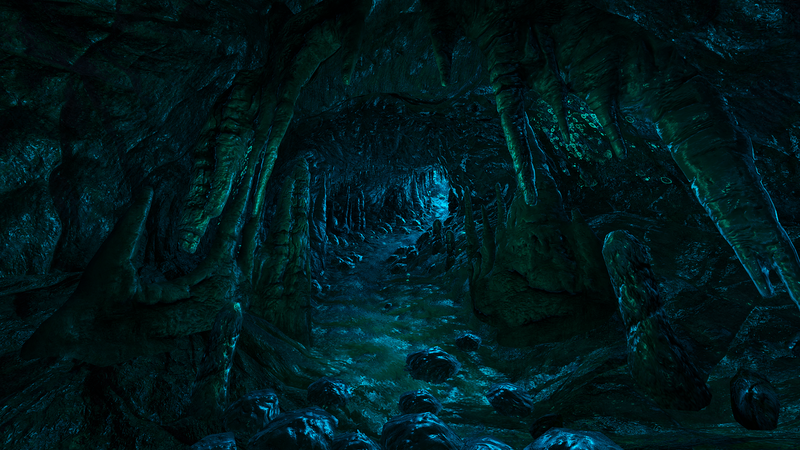 In shifted form druids walk through the portal into the dark under caverns. Their senses on fire as the dank cool dark looms before them. A smell was on the air. Making their way through the dark maze they come upon foul stench...abominations of nature! The undead were present and among them lay the corpses of the Drow that were there littered the cavern floor. The group would soon realize that they stood in their way of getting to the task handed down. Every inch would be a battle to the final resting place. Somewhere in the deep dark barely able to find their way the clangs of weapon on shield and weapon can be heard. With each step the sounds can be heard closer. Stepping forward into the dark a ledge comes to with sharp crevice below. On a small ledge leading into the deeper dark of the under world two undead fight endlessly, cursed to dance in combat for eternity. With each clang the cauldron draws closer. For the keen of eye their visage may hold a look of relief to see the acorn adorned iron pot draw closer. The cauldron before them the endless suffering of their immortal combat is ended and the bones drop down into the abyss. An end to hundreds of years of fighting. Two factions finally see an end and so do the souls of their patrons. The altar is set, the candles are lit. The cleansing and anointing ritual is performed. Then the exhaustive praying and chanting begins. The Doombringer invokes the spirit of his deity upon the midnight hour as is the custom for his clergy. The transgression is whispered to the agent of his lord upon summons. The call of retribution was heard. Judgment would be meated out for the forest walker who had attacked a lady known as Lannia Ranloss. The beast would learn what was done with creatures who also did not respect the lands of man as they expect of man in their woods. All of his energies exhausted the Doombringer collapses to the floor. A feeling of being pulled in his dreams as he rests comes over him. Last edited by Androoh on Thu Feb 01, 2018 12:32 pm, edited 1 time in total. Androoh wrote: Along the coast way and around various outlying lands and hamlets near the Friendly Arm Inn, some talk might be spared toward the appearance of a tall, armoured stranger clad in battle-worn half-plate and carrying a dull-metal kite shield bearing the symbol of the Doombringer upon it's polished surface. Reported to have been enquiring as the whereabouts of a group known as the Hunters of Vengeance, and not lingering in any place for too long, there is further mention spared to the visage of the figure asking - most notably, the greenish cast to his flesh and a tusked underbite. Patrons of the area would talk of hearing about some things happening up further North from the Friendly. Near the Gate area. There was talk of a small shrine to the god on his shield up there in the back alleys of the docks. There is also some further yet who would talk of two individuals in particular as of late that were well known in the towns as followers of Hoar. One Kory Sentinel and a Wren Di' Corvi. All of them could agree that the ones he sought were up North most often to look there. ////A time to RP and meet up can be arranged at your convenience. Both Kory and Wren have the power to bring you along in the group. I am the admin of our group and Wren is the IC leader of the HOV currently. This you will all learn through RP if you wish! A darkened hall lay dormant, silent, no breeze to stir the inglorious tapestries on the wall, no fire to throw its shadow dancing along stone. Months had gone, with no grim march from sanctum to shrine; wine to spill for brood or celebrant or celebratory cause was corked, glass dim with dust. The dire chambers were still. Distant, the heavy scratch of a great stone moved by solemn will shook the quiet cave, and with painstaking crescendo, the report of boots on a forgotten floor drew nearer with the ominous rhythm of a fading heartbeat. Louder, again louder, came each oathful stride, till step struck a pelt laid reverently before the hearth. There was the sound of metal in mildest protest, and a spark. The wisp of a thing thin and dry caught flame, and there grew flickering, warm light that revealed a gaze cerulean and gold, lambent and intent. In some circles, the knowing is grown that a man has taken up the torch of the Hunters of Vengeance. For now, he seems errant in his quest. After some time away, a black-clad lancer is again seen in slow cadence through the lands north of Baldur's Gate. Ever near water, falls or streams or pond, he makes his way deliberately about, burning spear in carriage, driving away whatever monstrous things trespass too close. On restful days, the sound of a lute carries along the waterways. Three figures met under the oppression of a dreary night sky. The stars refused to show themselves clearly, but the torches set in the stone of the arena walls burned bright upon the Wisp, the Wolf, and the Thorn where they spoke. As their meeting place was infamous for violence and bloodshed, so their faces too were serious as they spoke of deeds that only the gods and the rats that scrabbled underfoot might hear. 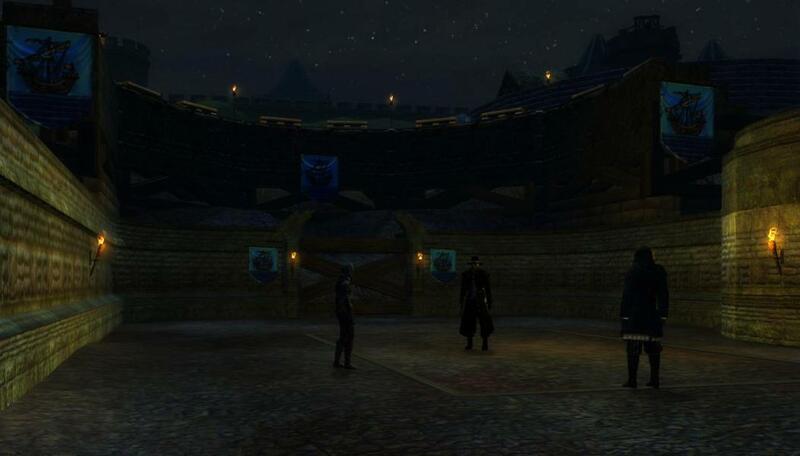 As quickly as they came together, they dispersed again and the arena stood empty once more. The Hunters took each to their different roads as a bell tolled in the distance.